It’s a basic human need. I scream desperately for something different. The pieces aren’t the same, but they aren’t different; they are similar. The differences are slight, subtle and sometimes not in focus. I just want a piece that will stand out from the others. It’s a human strength – the psychological wiring that ensures we find the first of the ripe fruit, notice the predator in spite of attempts at concealment, and leave the supermarket with sale items overflowing from our shopping trolleys. Can you see the figure reclining on a bench, over-run and exhausted? You may have to step back from the screen a bit. 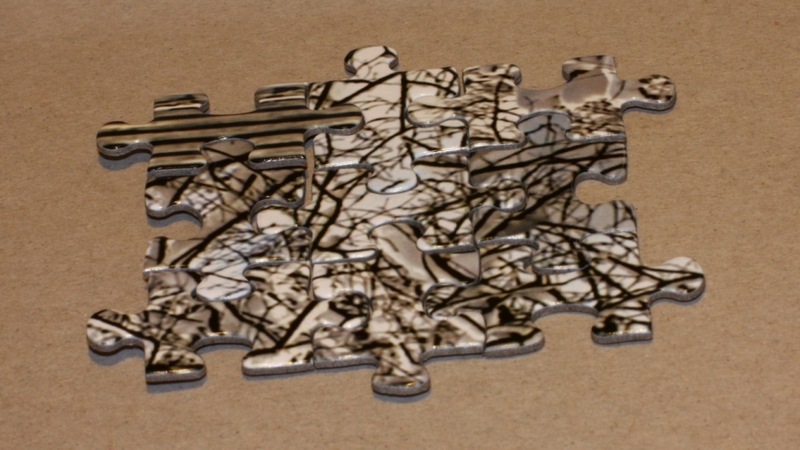 In this photographic series, I select a number of odd pieces from a puzzle and re-assemble them. The aim is to distil something of the experience of this particular puzzle. In this winter scene, there seems to be nothing but snow-covered branches. Hinkler Mindbogglers, simply titled “Snow Cabin, New York State”.